This paper attempts to evaluate the impact of Indonesia-China trade liberalisation in changing Indonesian trade and Indonesian society welfare. To evaluate such impact, the study uses the Software for Market Analysis and Restrictions on Trade (SMART Model) and Social Accounting Matrix 2008 (SAM 2008). Based on the result of the Indonesia-China trade liberalization scenario analysis, it is found that the net income received by the households due to the foreign trade with China is negative, which means the amount of the household expenditure due to the huge amount of Chinese commodities entering Indonesia is still higher compared to the amount of the household income received as a result of the Indonesian export of its commodities to China. The increased net income is enjoyed by all types of households. Badan Pusat Statistik. 2010.Sistem Neraca Sosial Ekonomi Indonesia. Jakarta. Chandra, A. C., dan L. A. Lontoh. 2011. Indonesia-china trade relations: The deepening of economic integration amid uncertainty? Trade Knowledge Network. Available athttp://www.iisd.org. Krugman, P. R., dan M. Obstfeld. 2005. International Economics: Theory and Policy, Edisi ke-7. Boston: Addison-Wesley. Nopirin. 1995. Ekonomi Internasional. Yogyakarta: Badan Penerbit Fakultas Ekonomi Universitas Gadjah Mada. Plummer, M. G., D. Cheong, dan S. Hamanaka. 2010. Methodology for impact assessment of free trade agreements. Mandaluyong City. Asian Development Bank.Available at http://aric.adb.org. Widjaja, A. 2000. Dampak liberalisasi perdagangan terhadap kinerja ekonomi Indonesia: Suatu pendekatan makroekonometrika. Disertasi. Institut Pertanian Bogor. 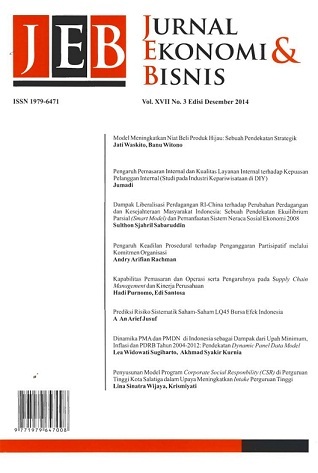 Available at http://repository.ipb.ac.id. World Integrated Trade Solutions/TRAINS. 2003. Database on International Trade and Tariffs, UNCTAD-World Bank Jenewa dan Washington.